Mount Yamnuska is an awesome hiking destination with several scenic trails to choose from. 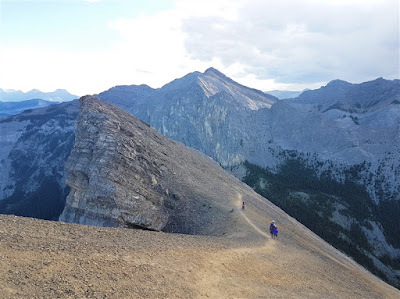 Depending on how much excitement you want in one day, you can hike to Raven's End, the Upper Viewpoint, or the summit. Raven's End is a popular year-round objective, while the Upper Viewpoint and summit are best done when the trail is dry. 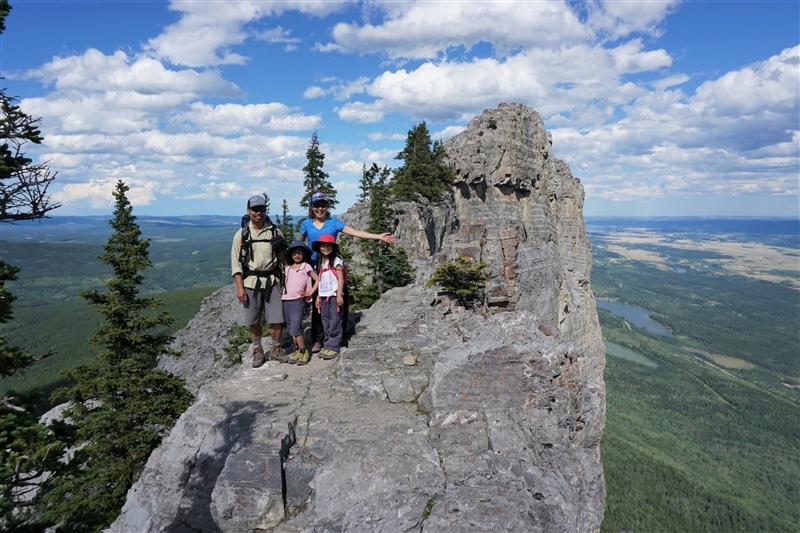 Raven’s End is a family-friendly hike that takes you to the cliff base on the east edge of Yamnuska. 7 km round trip, 460 metres elevation gain. 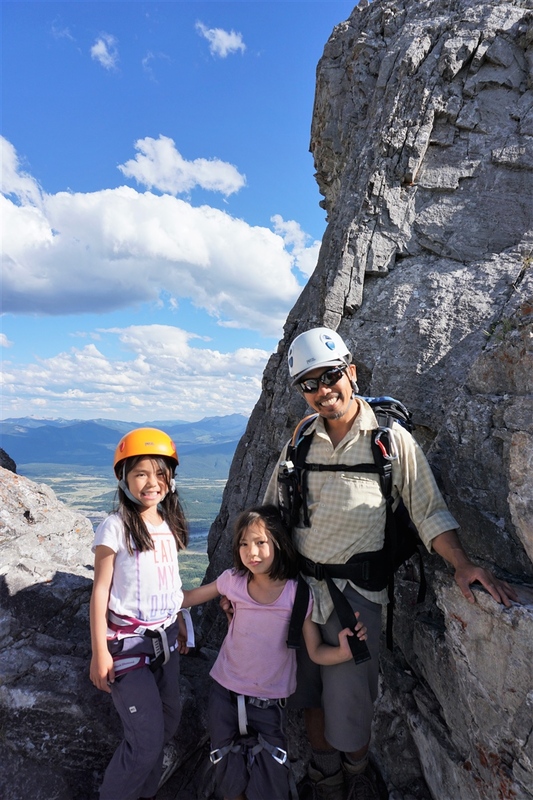 Upper Viewpoint offers amazing views of the cliff face, prairies, and Bow Valley for not too much effort. A bit of hands-on scrambling and downclimbing on the return are required. 8 km round trip, 650 metres elevation gain. 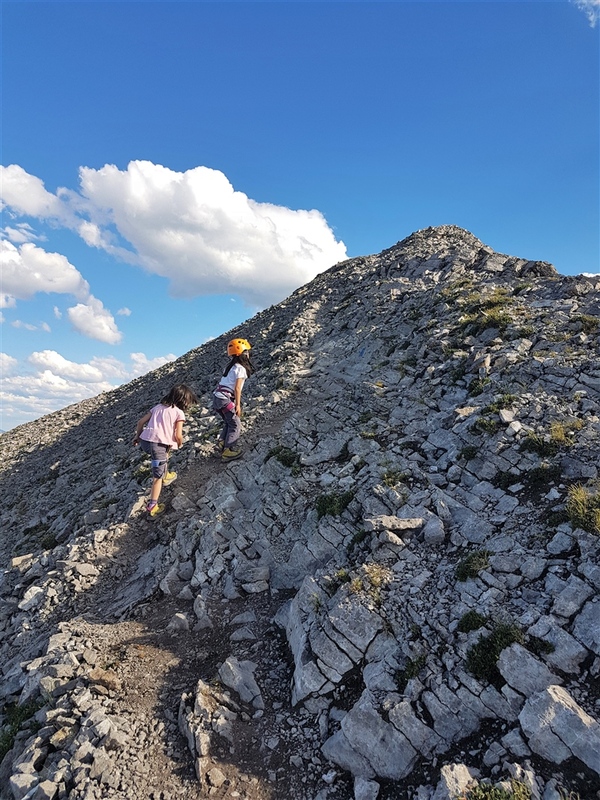 Yamnuska Summit (2,240 metres) is a fun, intermediate-level scramble that should only be attempted in the counterclockwise direction in dry conditions (it's possible to ascend from the west and avoid the chains and more difficult sections, but it's a scree bash). The trail has hands-on scrambling, scree, and sections with considerable exposure (major drop offs) including a 30-metre narrow ledge. With its short approach, it's possible for fit, experienced scramblers to head to the mountain after work and summit before sunset during the summer months. For safety, however, especially if it's your first time hiking "Yam," get an early start so you aren't caught out after dark. Many a hiker has been rescued from this mountain; don't underestimate it! 11 km round trip, 900 metres elevation gain. 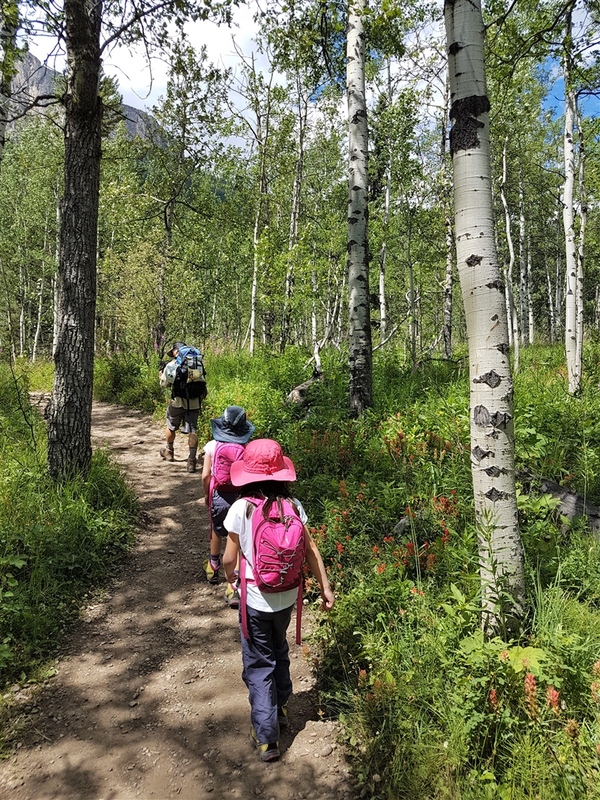 From the trailhead at the west end of the parking lot, follow the trail one kilometre through trembling aspens to a signed junction. 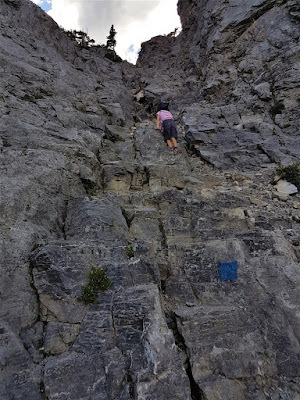 Turn right to stay on the hiking trail and continue climbing steadily upwards. At the next major junction (look for the arrow made of stones on the ground), turn right. Raven’s End is at the cliff base on the east shoulder of Yamnuska. Enjoy the view and go back the way you came or carry on to the Upper View Point/summit. The beginning is deceivingly easy. There are great views on the way to Raven's End! Go as far as you like! Going about 600 metres further, you will come to a crack in the wall blocked by boulders. This would be a good place to put on your rock helmet. Climb over the boulders, continue up the narrow gully, and make your way west to the panoramic Upper Viewpoint. Return the way you came unless you are going for the summit. Stay back from the edge - it's about a 150 metre drop! 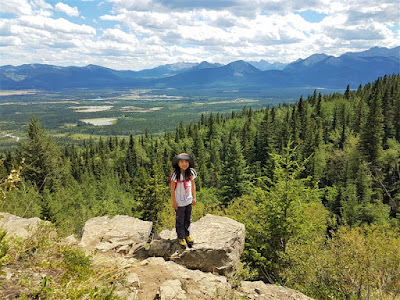 From the Upper Viewpoint, it’s less than a kilometre to the summit along a steep trail with loose rock and exposed sections. 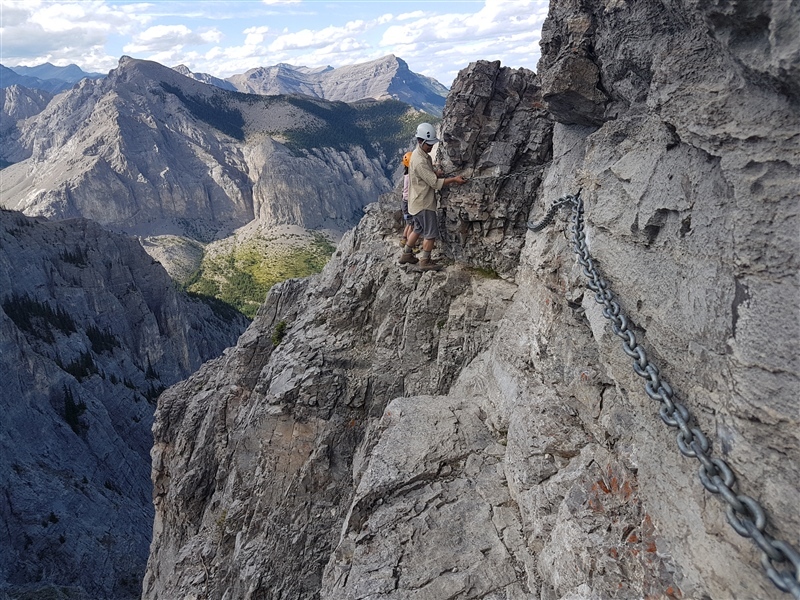 After 500 metres, you will be at the crux: a narrow, 30-metre long exposed ledge with a chain bolted to the rock for support. Expect a traffic jam here on summer weekends as some hikers nervously inch their way across and others turn back. Do not attempt this section in poor conditions; the rock is slippery when wet and a fall here could be fatal! 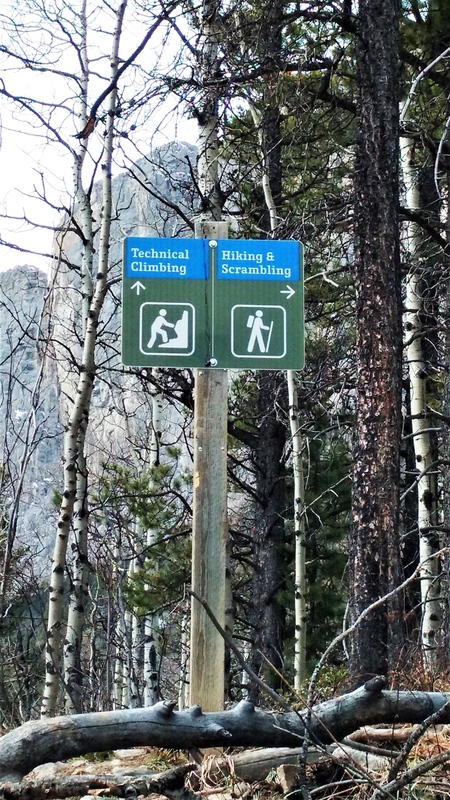 While the chains are an adventure on their own, the trail also becomes much more technical beyond this point. 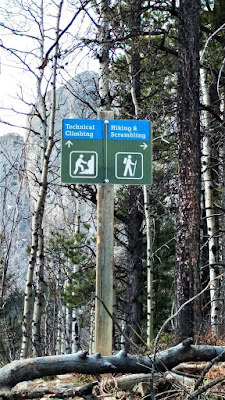 Route finding skills are helpful as some of the trail markers (blue squares painted on the rocks) are hard to see. According to Alan Kane's Scrambles in the Canadian Rockies 3rd Edition 2014 was when Kananaskis Country staff put blue paint to mark the route. 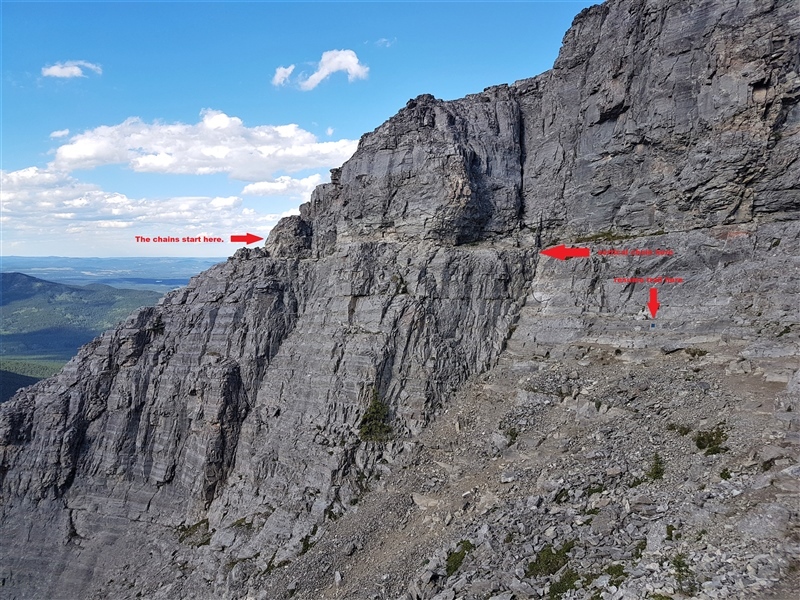 Mount Yamnuska Crux: a narrow, 30 metre long narrow ledge. and where the trail resumes (next blue marker). 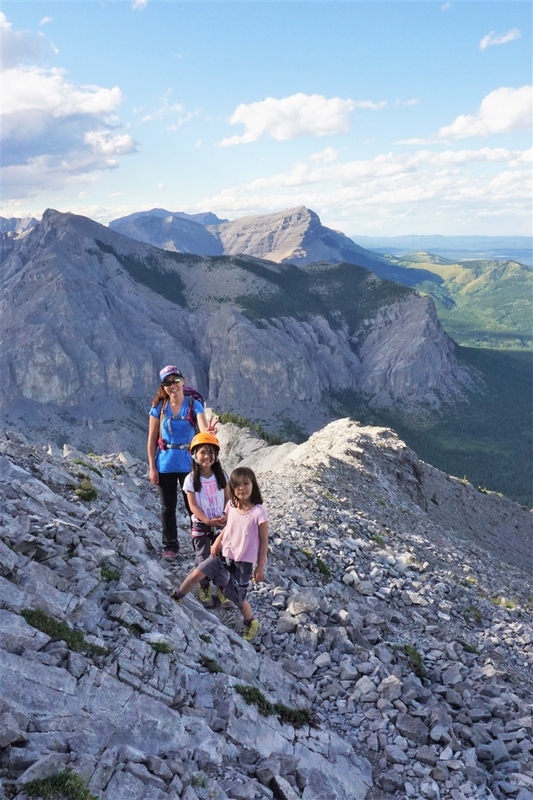 The final push to the summit (300 metres) is steep and loose, but presently you are rewarded with panoramic views of Kananaskis. Once you’ve caught your breath, pop your helmet back on (to protect against rock fall), and descend the west side of Yamnuska. Listening carefully for shouts of "Rock!" 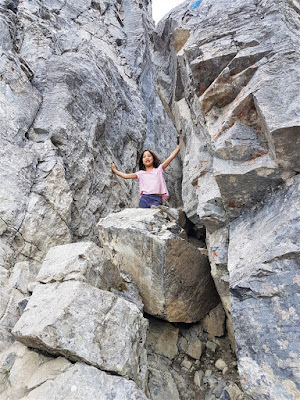 from climbers above you, follow the trail to the left, around the front side of the mountain, and traverse to approximately the middle of the rock face . 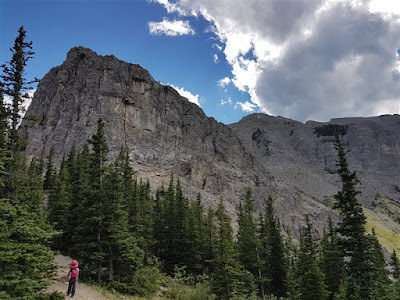 Once you’ve found the longest scree run, “ski” it to the bottom where it connects to a forested trail. Go left (east) until you reach the signed junction, then continue straight to the parking lot. 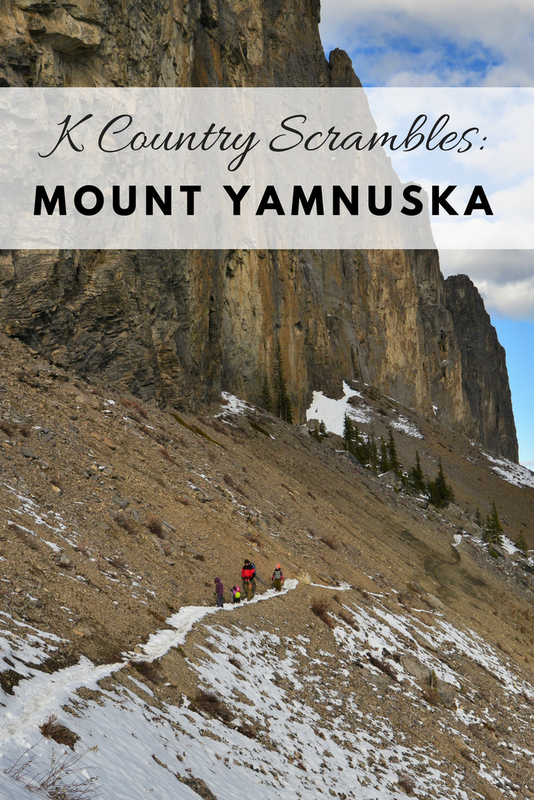 Mount Yamnuska is an exciting scramble that is worth training for! It is typically snow-free from June until November. If you're itching for a winter summit close to Calgary, hike to the marked junction, then follow the climber's trail west (NOT the hiking/scrambling trail). When you reach the scree slope, stay as far to climber's left (west) as you can to get traction - otherwise it's two steps forward, one step back. 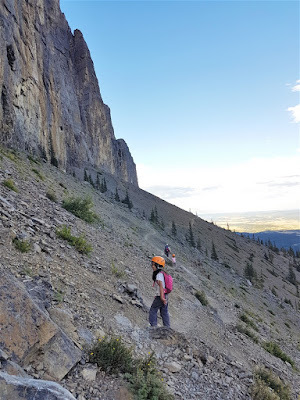 From the west shoulder of Yamnuska, follow the well beaten path into a small dip, then continue to climb around the back side of Yam. Stay to climber's right as the slope drops off to the left. Continue straight to the summit cairn and return to the way you came, or for a quicker way down, traverse the front face of Yam to the middle of the mountain. Where the scree run looks longest, "ski" it to the bottom. Rejoin the forest trail, turn left, then head down to the parking lot. Hiking boots and rock helmet recommended for the Upper Viewpoint and summit. Trekking poles are nice to have for the descent too. Get an early start or go midweek to avoid the traffic jam at the chains. You can prepare for Mount Yamnuska by doing steep hikes like Prairie Mountain, and easy scrambles such as Ha Ling Peak, Miner's Peak, Midnight Peak, East End of Rundle, and Mount St. Piran. While we took our children to the summit in 2017, please note that we do NOT recommend this hike with children. It was our third attempt and we did a lot of preparation. 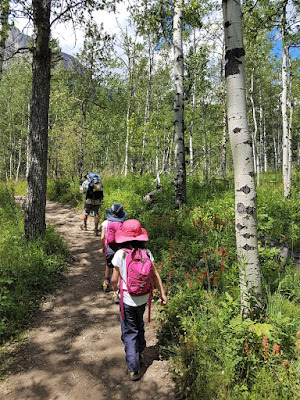 In addition to taking the girls on several easy scrambles in the years leading up to this hike, we used climbing harnesses, and leashes (locking carabiners and webbing) for the chains section, started early, and went in dry conditions. 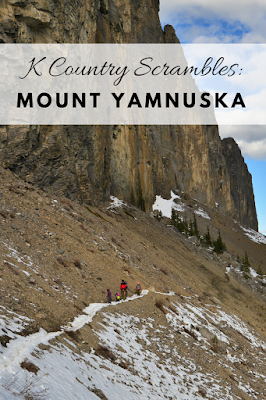 While locals call it Yamnuska or Yam to honor the local Stoney people (Iyamnathka means “flat faced mountain.”), its official name is Mount John Laurie. In 1961, the Stoney Nakoda First Nation requested that that mountain be renamed Mount John Laurie in recognition of his work promoting First Nations' causes. 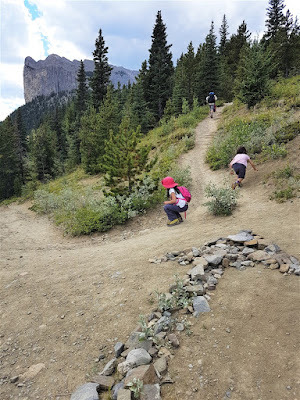 This is a super accessible hike and a great way to get to the alpine. 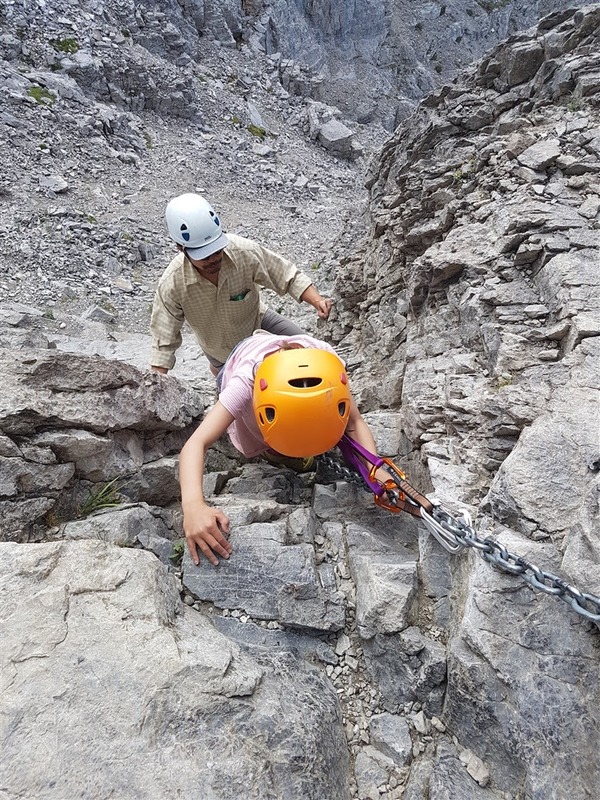 It's awesome to see your kids under safe and experienced parents meet the challenge of the route. Well done !